Yes, I know. I've served you apple crisp before- without oats. And it's quite lovely. It is. Especially for celiac folks shunning oats (find my oat-free apple crisp recipe here). But. Now that truly gluten-free oats are easier to come by, we at Casa Allrich have had a major hankering for the classic oats and butter and brown sugar combo. And so- a new recipe was born. I just ate it for breakfast. 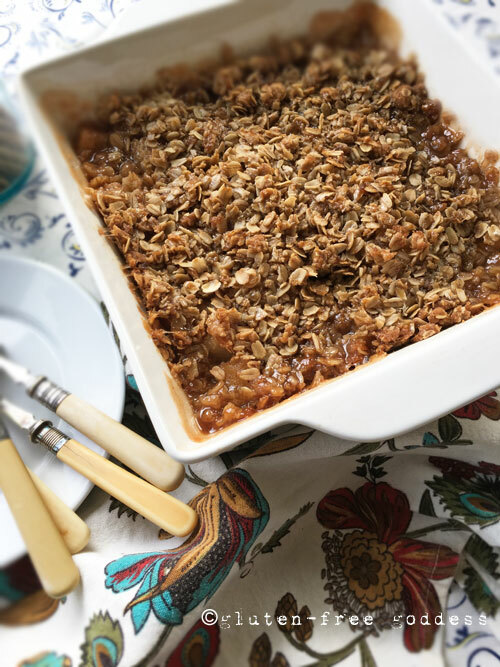 Easier than apple pie and classically delicious, this gluten-free apple crisp can be gussied up with a scoop of vanilla bean ice cream. Or serve it for brunch with a dollop of Greek yogurt. Preheat the oven to 350ºF. Butter the bottom and sides of an 8x11-inch gratin or baking dish. Set aside. Peel and core the apples. Cut them into chunks and toss into a bowl. Sprinkle with lemon juice, cane sugar, cinnamon, a tiny pinch of sea salt, and toss to coat. Dust with the tapioca starch and stir again to coat. Pour into the prepared baking dish. Dot the top with 2 tablespoons of chilled butter, cut into small pieces. In a mixing bowl, combine the rolled oats, sorghum or brown rice flour, brown sugar, cinnamon, nutmeg, and sea salt and whisk to blend. Add the chilled butter in pieces and using a fork or a pastry cutter, quickly cut the chilled butter into the flour blend until you have a crumbly, sandy mixture. Rub the mixture between your palms to create larger sticky crumbles. Spoon the oat crumble mixture over the apples. Bake in the center of a pre-heated oven for about 20 minutes. Then cover the top loosely with a piece of foil and continue to bake for another 20 minutes or so, until the apples are fork tender and the crisp is bubbling. Allow the crisp to cool slightly before serving. It is luscious warm from the oven. A scoop of classic vanilla bean ice cream is optional. 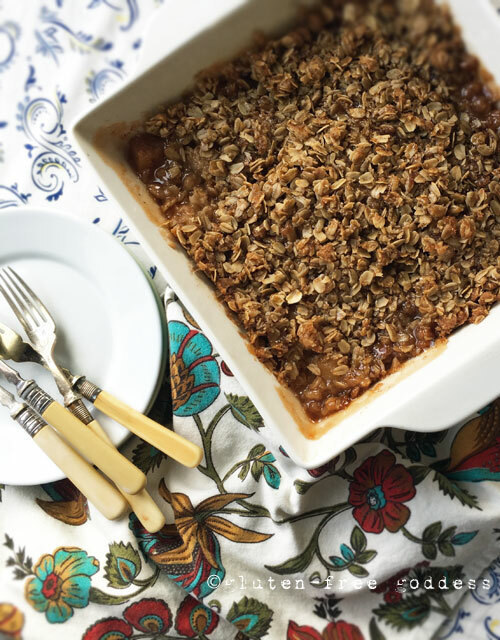 Chill leftover apple crisp and enjoy the next day, chilled, right out of the fridge. Baking time : 40 to 45 minutes.